John Quiggin is an Australian economist, a Professor and an Australian Research Council Federation Fellow and a Laureate Fellow at the University of Queensland, and a member of the Board of the Climate Change Authority of the Australian Government. 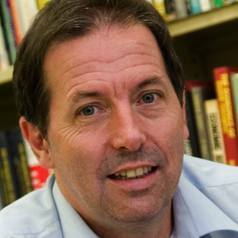 He was awarded the Australian Social Science Academy Medal in 1993 and a Fellowship in 1996, received the 1997 and 2000 Sam Richardson of the Institute of Public Administration, Australia, received the 2001 Editors Prize of the Australian Journal of Agricultural Economics, a Fellowship of the Australian Institute of Company Directors in 2002, and a Distinguished Fellowship of the Australian Agricultural and Resource Economics Society in 2004. He is a Fellow of the Econometric Society and in 2011 received the Distinguished Fellow Award of the Economic Society of Australia. A prolific author and blogger, Professor Quiggin's most recent book, Zombie Economics: How Dead Ideas Still Walk among Us, was published in October 2010 from Princeton University Press.